When you've been asked to speak in any public forum, the experience can be somewhat nerve-wracking. But when you're asked to give a speech to your university peers, it can feel even more intense, mainly because you're likely to be graded and judged on your performance. However, there are many terrific ways for you to shine on stage even if your insides are quaking from the challenge. Check out some of the ideas here and make certain your future university speeches earn high marks and praise. Obviously, this should always be the case if you're a public speaker worth your merit, but if you're giving a speech to your university peers, it's even more important that you know what you're talking about. Consider it this way - your listeners will expect you to be the expert on the topic area. That's just a fact. Does this mean extra work for you in terms of preparation? Absolutely. But will you regret the time spent in planning? Never. It doesn't matter if you want to rehearse your public speaking engagement in front of friends, family members, a video camera or the mirror in your bedroom; just make sure that you do it. Practicing will allow you to gain a measure of ease when speaking, creating the illusion that it's "second nature" even if you're experiencing inner anxiety. If you're going to open your speech to questions from the audience (and perhaps your professor as well), it will behoove you to consider ahead of time what you think those queries might be. Having trouble trying to anticipate questions on your own? Enlist some friends and have them develop some hard-hitting queries for you to answer based on the nature of your speech. Unless you've been given your topic, choose one that you'll enjoy discussing. For instance, if you hate Renaissance art, don't speak about Da Vinci. Not only will your discussion be more exciting for you, it'll also be more interesting for your audience because you'll obviously be enjoying the topic. It's a good idea to focus on only 3-5 main points throughout the course of your speech. This makes it easier on both you and your audience members. Try making an outline for yourself; you'll have a better chance of staying within these guidelines. Use a stopwatch or wristwatch to time your talk; you may want to keep a similar device on the podium or in front of you to ensure you don't "run the clock". It's tempting to "wow" your audience with tons of visual elements such as elaborate PowerPoint slides or colourful handouts, but those devices can easily overshadow your talk. 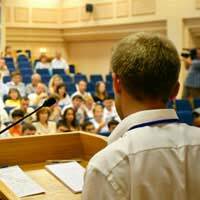 Remember that your speech is about the topic, not about how pretty an overhead projection is; if your talk cannot stand on its own power, it isn't a solid presentation. Finally, there's nothing wrong with engaging the members of your audience in the discussion. If you can bring them into "the action" in some way, they'll be more likely to stay with you from beginning to end. And that could result in an excellent grade from your instructor.